The Subject and The Object - are two parts of a sentence. 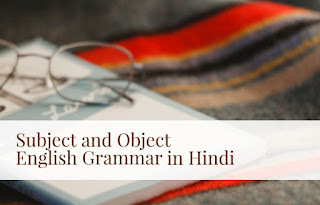 Subject (कर्ता) और Object (कारक) - एक वाक्य के 2 भाग हैं. Subject is part of the sentence in which the person or object that we are talking about is identified. The subject of the sentence usually comes first. Only on rare occasions it is put after the predicate. कर्ता (subject) वाक्य का वह भाग है जिस में हम उस व्यक्ति या वस्तु को चिन्हित करते हैं जिसके बारे में वाक्य में चर्चा करना होता है. वैसे तो कर्ता वाक्य में कारक के पहले आता है लेकिन कुछही मौकों में कर्ता को कारक के बाद लिखा जाता है. 1. The building is big. The building is the subject. 2. Rita runs. The subject is Rita. The Object is the other part of the sentence that tells us about the what is being affected by the action the subject. कारक (object) वाक्य का दूसरा भाग है और यह जानकारी देता है कि कार्य का प्रभाव किस पर पड़े रहा है. 1. He has good memory. He is the subject and good memory is the object. 2. Jack and Jill went up the hill. The subject is Jack and Jill while up the hill is the object. Sometimes in imperative sentences, the Subject is left out. This is done frequently when the speaker is directly addressing someone and giving him/her some instructions..
कुछ imperative sentences, ऐसे भी होते हैं जिन में कर्ता को छोड़ ही दिया जाता है. अक्सर जो बोलने वाला किसो को सीधे सम्बोधित कर कोई निर्देश दे रहा होता है. 1. Sit down. In both these sentences, the subject you is understood. 2. Get out. इन दोनों वाक्यों में कर्ता तुम / आप (you) समझ लिया गया है.